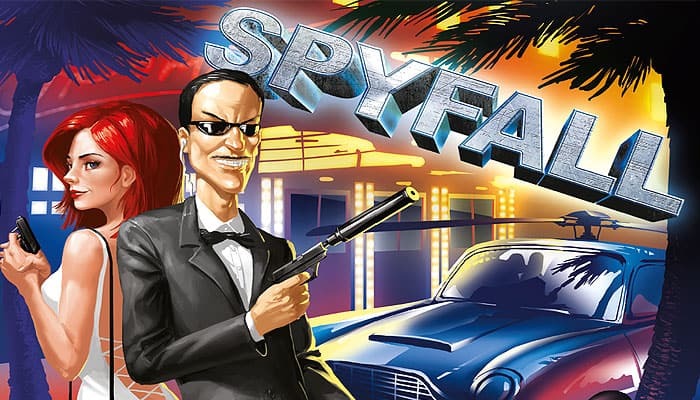 A game of Spyfall is made up of several short rounds. 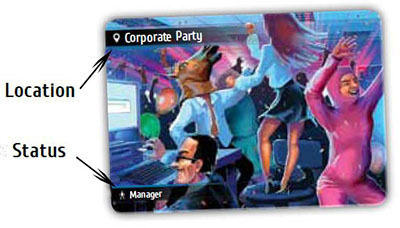 In each round the players find themselves in a certain location with a specific role assigned to each player. One player is always a spy who doesn't know where they are. The spy's mission is to listen carefully, identify the location, and keep from blowing his cover. Each non-spy must give an oblique hint to the other non-spies suggesting that he knows the location's identity, thus proving he's not the spy. Observation, concentration, nonchalance, and cunning - you'll need all of them in this game. You will also need to keep track of time during the game, so make sure you have a stopwatch handy. One of the players probably has one on their cell phone. The spy's objective is to avoid exposure until the end of a given round or identify the current location. The non-spies' objective is to establish consensus on the identity of the spy and expose him or her. Before the first round begins, sort all the cards into location decks. Each deck should have seven cards with identical illustrations and one spy card. Each deck goes in a separate ziplock bag. All cards should be face down, with the spy card on top. All the locations are shown in the middle spread of the rulebook. The players are advised to study it well before the first round begins. This should give the "potential spies" an idea of the kinds of locations they will have to choose from during the game. We strongly advise the spies not to study the middle spread during the game - that's a dead giveaway. Each game is a series of short rounds, the number of which is agreed upon by the the players before the beginning of the game. We recommend playing five rounds for your first session (this should take about an hour). A new dealer is chosen for each round. The dealer participates in the game as a regular player. The most suspicious-looking player is the dealer in the first round. This player takes all the card ziplock bags out of the box, turns them face down, shuffles them, and chooses a random ziplock bag. The dealer then removes the cards from the selected ziplock bag very carefully to avoid turning them over. The dealer selects a number of cards that corresponds to the number of players from the top of the stack, shuffles them, and gives a card to each player. If there are five players, five cards are played. The remaining cards are not turned over. Put them aside carefully - you won't be needing them. Each player looks at their card without letting the others see it, then places it face down in front of them. The dealer for each successive round is the player who was the spy in the previous one. That player selects a new deck and deals the cards as described above. The dealer starts the stopwatch, and the game begins. The dealer then asks one of the players a question, calling them by name: "Tell me, John..". The questions usually pertain to the current location. This is prudent, but not mandatory. Questions are asked once; no follow-up questions are allowed. Responses can take any form. The player who answers the question proceeds to ask any other player a question of their own, but cannot ask a question of the player who just asked them a question. The order in which the questions are asked is established by the players themselves and based on the suspicions they have after hearing the questions and answers. Note: If you are not the spy, your card will also specify your role at the given location. 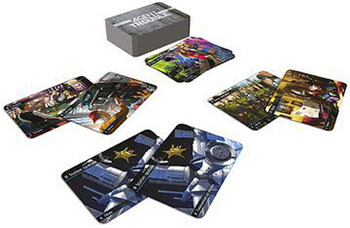 Before the beginning of the game, the players should agree on whether they will adhere to the role on their card and play the corresponding role or not. We strongly recommend doing this in order to make the game more interesting, but not for your first few game sessions. For example, if you're a college professor and somebody asks you why you missed the faculty party, you can complain about your age and arthritis; if you're a student, you might want to express your outrage at not having been invited by the senior faculty. The name of the role might seem to suggest that you're playing a male character, but all characters can actually be either male or female. So the flight attendant on the airplane could also be a stewardess, or the actor could also be an actress. Anne, Juan, Maria, and Isaac find themselves in the crusader army. However, Anne isn't aware of this because she got the spy card. Juan gets the Knight, Maria the Squire, and Isaac the Archer. They all play their parts and try to identify the spy. Anne's goal is to identify the location without blowing her cover. Maria the Squire asks the first question: "Isaac, do you remember which sea we took a dip in yesterday?" Isaac the Archer naturally names the Mediterranean, and Anne the spy takes notice: the location could be the beach or the pirate ship. Isaac can't ask Maria, so he asks Juan, "Juan, when do we get paid - is it at the beginning of the month, or the end?" All the other players are on the alert, since the question might identify Isaac as the spy. However, Isaac is just sounding out his fellow players. Since Juan is a knight and not a spy, he answers the question easily: "Who knows? 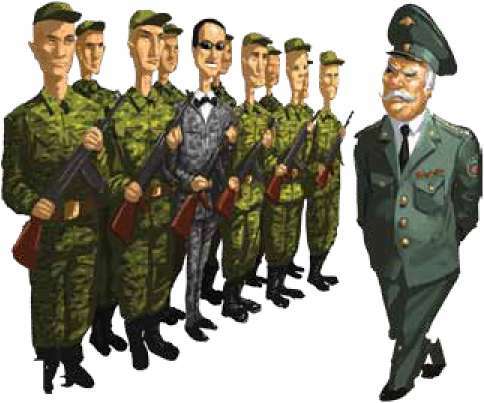 We'll get paid whenever the commander feels like paying us". Anna the spy is thoroughly confused - now she suspects the location might be the military base or the submarine. Juan asks her next question: "Hey Anne, what did they serve for dinner yesterday? I couldn't make it". Note: The players can agree on a different round length. Make sure you decide how long you want rounds to be before you start the game. First-time players might want to play longer rounds - say, 12-15 minutes. When time runs out, each player (starting with the dealer) gets to accuse another player of being the spy. Players are now free to discuss their suspicions. If ALL players agree with the dealer's accusation (the accused doesn't get to vote), then the accused player's card is revealed. 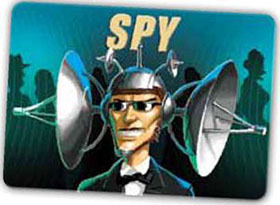 If a spy card is revealed, each of the non-spy players win. If a non-spy is revealed, the spy wins. If the dealer's choice is not unanimously convicted, the accusation phase proceeds to the player on their left. The accusation phase continues until a unanimous vote is achieved. 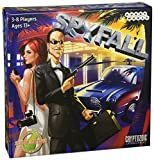 If no one is convicted of being the spy after each player has had a turn as accuser, the spy wins. A player may be accused multiple times during this phase (and never gets to vote on their own behalf). Each player may stop the clock once per round to declare one of the players a suspect and ask the others to vote. If all players agree (the suspect doesn't get a vote), the game ends and that player's card is revealed. If there is not unanimous agreement, restart the clock, and the player who made the accusation cannot use this action again this round, but can still make an accusation after time has run out (see #1). It's in the players' best interest to perform this action. It might also benefit the spy to use this action in order to divert suspicion from themselves. The same person may be the target of multiple accusations during a round. Note: Players should abstain from discussing the spy's identity during voting. 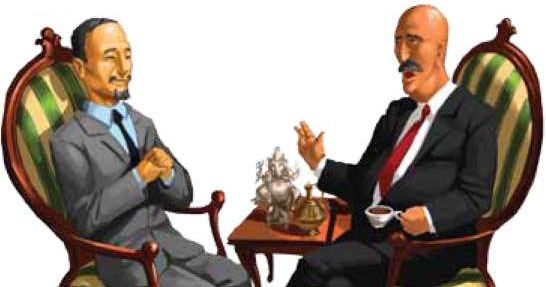 The players' arguments "for" and "against" the spy's identity could inadvertently reveal the location's identity to the spy. The spy can stop the clock at any time (except when the clock has already been stopped by another player) by revealing their spy card to the other players. The spy is then allowed to consult the location list in the middle spread of the rulebook and identify the current location. The spy wins if they identify the location correctly. Otherwise the other players win. Note: The spy may only reveal his card while the game clock is running, and has not run out! Once the round is over, the cards from that round are returned to the dealer and can no longer be played in the current game. The ziplock bag with this deck is returned to the box. The objectives of the non-spy players are to identify the spy and avoid revealing their location. Therefore, the non-spies should refrain from being too explicit in their questions: (for example, "How much cash did the robbers steal yesterday?" The spy will instantly identify the location as the bank). 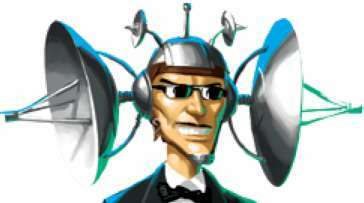 However, when a player's questions and answers are too vague, other players might start suspecting them of being the spy, enabling the real spy to win. The spy's objective is to listen as carefully as possible to what the other players say and do their best to avoid blowing their cover while also trying to identify the location before eight minutes have passed. A spy who doesn't attempt to guess the location is taking a risk - it is entirely possible that the other players will identify them after discussion and voting. Tally up the points earned by the players at the end of the round based on the results. Victory: The spy earns 2 points if no one is successfully accused of being the spy. The spy earns 4 points if a non-spy player is successfully accused of being a spy. Victory: Each non-spy player earns 1 point. The player who initiated the successful accusation of the spy earns 2 points instead.